Is that title confusing? Don't worry, all will made clear! Last weekend Elise and I were discussing way to improve our "studio" room. This is the room that holds our computers and art and craft supplies and comics. Plus junk. Lot of random junk. One of the many eye sores in the room is my big collection of 18 long boxes and 2 short boxes of comics. Elise has 2 long boxes (only one remains full). As we talked I told her about some new boxes that are actually drawers. So instead of having to move box after box after box to put away comics you just pull out the drawer and you're done! Brilliant! Wonderful! Expensive! Yeah, the really good drawer boxes are about $20 a pop, where as a regular long box runs about $7. I wasn't ready to drop that kind of cash but I was sorely tempted! Tempted enough to look for some alternatives online. I found some really nice custom made wood cabinets...with no price listed. This of course translates to "if you have to ask, you can't afford it". So I kept looking, I found a few solutions, but not many. 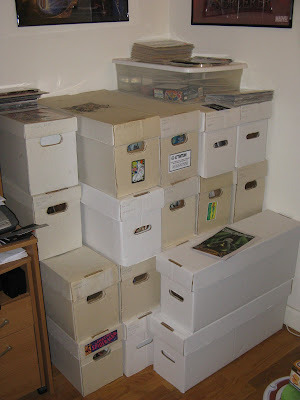 Some people use filing cabinets which are slightly less ugly than a bunch of dirty long boxes, but they are also expensive and heavy and not really ideally suited to holding comics. Surprisingly there aren't many clever solutions to comic book storage to be found online! But I did manage to run across BCW Supplies. 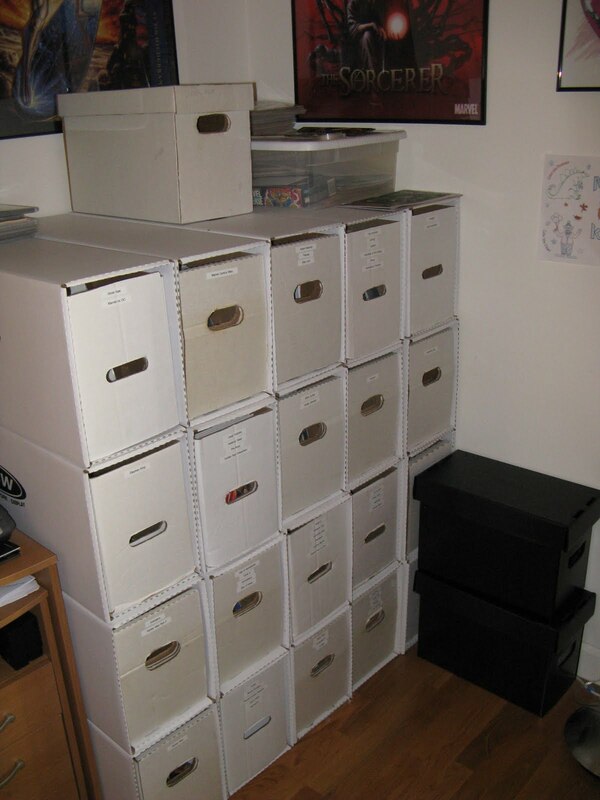 They had a version of the comic book drawers that were cheaper and just as sturdy than the original creators of the Drawer Boxes. The bonus is that BCW gives you the option of just buying the housing, so you can use the long boxes you currently have (minus the lids)! I decided to give it a go and Elise was taken in by the black plastic short boxes, which I also considered but their cost each was considerably more expensive than what I had planned and they didn't really solve the problem of easy box access. Shipping was pretty expensive, but I did order 20 boxes (taking advantage of their volume discount) and it was a combined weight of nearly 50lbs! 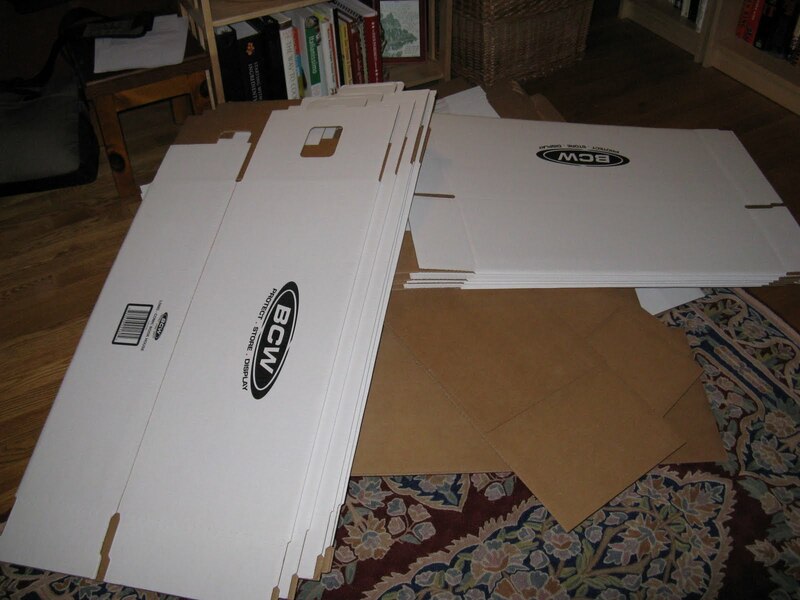 Putting the boxes together was actually pretty easy and I'd say the whole process took no more than 15-20 minutes which was far less than I had anticipated. Once everything was switched out (with a healthy dose of swearing and knocking stuff over) we both felt there was a big improvement, it was much less messy looking and more organized, if a bit imposing too. Upon some testing I found the drawers were not quite what I expected. Although to be honest, looking back, what I was expecting was somewhat silly, given the materials. I assumed it would be a piece of cake to pull the drawers out and generally it is, it's not more difficult to move the bottom box than the top, but the drawer housing doesn't change the weight of the long box, so you are still tugging on a 30lb box! It can be a bit of a challenge but it's much better than moving 3 whole boxes to get to the one on the bottom. The houses are very sturdy, even with all the weight of 3 boxes above them they do their jobs wonderfully. One other thing, or two, that I noticed last night is that you have to support the heavier boxes, they don't hang out of the housing very well and when you do pull them out the comics inside tend to fall forward, making it a bit hard to get new books into anything other than the very front. I think I just need to fine tune my technique, even if I have to pull the whole drawer out to put some comics away it'll still be FAR easier than it used to be. Better, not perfect but much better. As of now, I'm pretty happy and am looking forward to putting away new comics! Cosmic Cognizance: The Living Tribunal! Welcome back my favorite four-color fanatics! I have a new Cosmic Cognizance character to captivate your craniums! ...whew, I think I almost over alliterated there. First appearing in Strange Tales #157 in 1967 he revealed himself to Dr. Strange and threatened to destroy Earth unless Strange was able to prove to him that earth was capable of more than just evil. Pretty standard comic book fare really and a bit of an overused Stan Lee plot device, but eventually the character was elevated far above his origins. Today he is the law of all that is. His word and decisions ultimately dictate reality and not just the main Marvel Universe (aka 616) but for the entirety of the multi-verse. His rulings and powers are able to literally chance the laws of physics. The Tribunal, for example, even declared that the all powerful Infinity Gems were no longer allowed to work in unison. He was able to be captured by Thanos while Thanos possessed the Infinity Gauntlet, along with just about all of the universe's gods and abstract concepts (most of which will eventually be spotlighted in other CC posts), but Adam Warlock bowed to his judgement when Adam briefly held the Gauntlet, recognizing the Tribunal's ultimate authority in the universe, despite actually being more powerful than the Tribunal at the time. The three faces of the Living Tribunal represent Equity, Vengeance and Necessity, respectively (I believe that means from left to right in the image). The few times the Living Tribunal has chosen to reveal his covered face to someone, it is always reflection of that character's own face. The face is a "Cosmic Mirror which reminds us to always judge others as we would have ourselves judged." The Tribunal has hinted that there is One that even he serves. I suspect that this "One" is a fourth-wall breaker. In a Fantastic Four story (FF #511) they manage to get to meet God, who happens to be sitting at a drawing board and speaks and looks exactly like Jack Kirby! 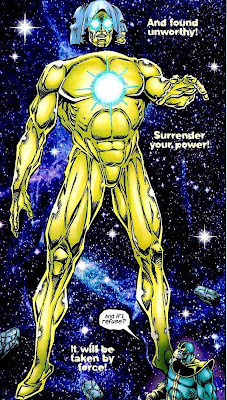 If this is truly who the Living Tribunal is referencing, then I can imagine no greater God to watch over the Marvel U. Good Morning faithful bloggees! It's your humble blogger, The Goog, back for more showing off! 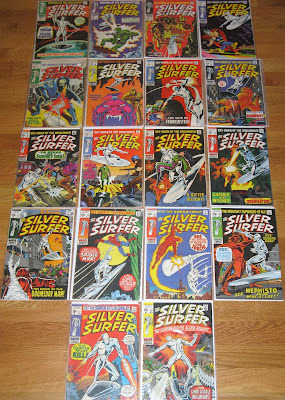 Lately, or well, the past year or so, I have been working to complete a run of The Silver Surfer, Vol. 1. I originally had just assumed such a task was out of my price range so I bought a copy of The Essential Silver Surfer (which collects all 18 issues of the series in an affordable b&w trade). I enjoyed it so much that, just curious, I took a peek at what some issues were going for on Ebay. To my surprise there were quite a few up for very affordable prices...and some not so much. After not too much thought at all, I decided that I'd like to try grabbing a few for my collection. The first issue I snagged was #3, which is the first appearance of Mephisto, Marvel's version of The Devil (or a Devil). I've always like him, so it seemed like a nice book to have. That of course sparked me to keep looking for good deals and slowly I started to piece the collection together. I tried to only use the money I made from selling unwanted comics on Ebay to buy other (read: better) comics. So for the most part the whole collection was essentially traded, which worked out well for my bank account. The main challenge about this collection is that when these books were released, 1968-1970, they weren't hugely popular. The Surfer was something of a pop culture figure along with the Hulk and Spidey and was popular with the college crowd but the books were not big sellers, so they didn't print many, making them somewhat scarce now-a-days. But with persistence and patience great deals can be found. The latest acquisitions, which have a nice kind of poetry to the idea, were #1 and #18, the first and last issues. I got an amazing deal on #1 which is in fantastic condition and probably worth quite a bit more than what I paid for it. All the books are in pretty nice shape and I'm still giddy about having them in my collection. So with this second goal complete, my first being collecting every appearance of Adam Warlock, I have decided to take a break from serious collecting. Well, at least until I have more books I want to unload on Ebay or the next Boston Comic-Con in April, which ever comes first!